"Hampstead Garden" redirects here. For the area of Adelaide, see Hampstead Gardens, South Australia. Hampstead Garden Suburb is an elevated suburb, north of Hampstead, west of Highgate and east of Golders Green. It is an example of early twentieth-century domestic architecture and town planning in the London Borough of Barnet in northwest London. The master plan was prepared by Barry Parker and Sir Raymond Unwin. Comprising just over 5,000 properties, and home to around 13,000 people, undivided houses of high value with individual gardens are a key feature. The area is dotted with landscaped garden squares or communal parks. Hampstead Garden Suburb was founded by Henrietta Barnett, who, with her husband Samuel, had started the Whitechapel Art Gallery and Toynbee Hall. In 1906, Barnett set up the Hampstead Garden Suburb Trust Ltd, which purchased 243 acres of land from Eton College for the scheme and appointed Raymond Unwin as its architect. This required a private bill before Parliament, as it was counter to local bylaws. The provisions of the new act, Hampstead Garden Suburb Act 1906, allowed less land to be taken up by roads and more by gardens and open spaces. On Central Square, laid out by Sir Edwin Lutyens, there are two large churches, St. Jude's Church and The Free Church, as well as a Quaker Meeting House. There are two mixed state primary schools in the Suburb, Garden Suburb and Brookland. There is also a state girls' grammar school, Henrietta Barnett School. The school used to house The Institute, an adult education centre, but The Institute moved first to East Finchley, then to Kingsbury and is in currently in the process of closing down altogether. Shops and other services are provided in the shopping parade of Market Place. 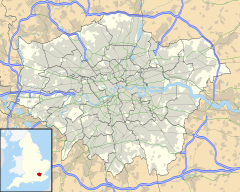 Shopping areas adjacent to the suburb include Temple Fortune, Golders Green and East Finchley. Little Wood contains an open air arena, which is used for summer theatrical performances by a local amateur theatre society. In 2015, the residents' association decided to implement a yellow and red card penalty system to discourage neighbours from using noisy lawnmowers and leafblowers. Freehold houses, flats and commercial premises within the Suburb are subject to a scheme of management approved pursuant to the Leasehold Reform Act 1967 by an Order of the Chancery Division of the High Court, dated 17 January 1974, as amended by a further Order dated 17 February 1983. The HGS Trust maintains the character and amenity of the Suburb and is responsible for implementing the management scheme. It has offices in Finchley Road. Freeholders are required to get the prior approval of the Trust before altering the external appearance of their properties. Consent is also required for significant changes to gardens, erection of garden sheds and felling or pruning of trees. The Trust is also the freeholder of the majority of the remaining leasehold property in the Suburb which are mostly held on very long leases. Urban town planning had been restricted by the byelaws established after the 1875 Housing Act, which had de facto called for a grid iron street layout, and a minimum housing density. This had prevented Cadbury building workers houses within a city, and caused Rowntree to build his housing in rural parishes. For Unwin to design a street structure that followed the contours, and built houses in cul-de-sacs a parliamentary act was needed. The Hampstead Garden Suburb Trust sponsored a private bill. "There shall not be built in the Garden Suburb on the average throughout a greater proportion of houses to the acre than eight". "On every road in the Garden Suburb (whatever the width of the said road) there shall be between any two houses standing on opposite sides of the road a space not less than fifty feet free of any buildings except walls, fences or gates." "With respect to any gardens, recreation grounds or open spaces provided by the Company for the common use of the inhabitants of any dwellings in the Garden Suburb the Company may make bye-laws for the regulation thereof...."
"Any road not exceeding 500 feet in length constructed primarily for the purpose of giving access to a group of houses in the Garden Suburb and not designed for the purposes of through traffic (known as an accommodation road), may with the consent of the local authority be exempted from any operation of any bye-laws of the local authority relating to the width of new streets and footways." Big Wood and Little Wood and the private Turner's Wood. The southern end is close to Golders Hill Park. Hugh Laurie – Actor & Musician. Jonathan Ross – TV & Radio presenter. Harry Styles – Pop singer with One Direction. ^ a b c Gayler, Hih J. (1996). Geographical excursions in London. University Press of America. p. 176. ISBN 0-7618-0328-9. Retrieved 24 August 2011. ^ a b c d Gye, Hugo (15 October 2015). "Noisy gardeners in posh Hampstead Garden Suburb will get football-style red cards for using leaf blowers and lawnmowers - and are urged to ditch modern machinery and return to 'old-fashioned manual tools'". The Daily Mail. Retrieved 16 October 2015. ^ "Hampstead Garden Suburb Trust". Hgstrust.org. ^ "Hampstead Garden Suburb Trust". Hgstrust.org. 6 January 2012. ^ "The Hampstead Garden Suburb Act 1906". Hampstead Garden Suburb. Hampstead Garden Suburb Residents Association. 1998. Retrieved 10 January 2016. ^ Ward, Victoria (31 January 2013). "Lord Justice Leveson and Richard Madeley fight planning application for underground pool". The Daily Telegraph. London. Wikimedia Commons has media related to Hampstead Garden Suburb. This page was last edited on 9 January 2019, at 19:51 (UTC).